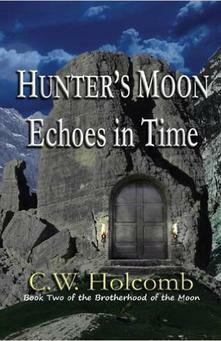 Hunter's Moon: Echoes in Time takes place soon after Dark Moon ends. Some of the characters are familiar, while others are quite unexpected; emerging into the flow of the story after being thought long since dead by the central characters to the novel. The Alien threat escalates with new upgraded machines that are stronger and more advanced than ever; while Raziel reunites with characters from his lengthy past: that trudge up memories of pain and vengeance from the Wars of the Moon centuries before! As the storyline thickens, a new more dangerous threat emerges into our reality from beyond the boundaries of our Universe. The same one that annihilated the Aliens Home World and sent them fleeing through the galaxy! Meanwhile a staticy message of renewed hope broadcasts over and over again on a serving officer's long range radio of a coming assault to retake the City and drive the Aliens back to their Mothership! There is also a mysterious entity that takes the form of a small boy that appears first in the distant past; in the long forgotten Age of Myth where the Pure Born Werewolves Zeus and Hera battle against a sinister diabolical force that seeks to subvert the land! Dark Moon is the story of Raziel, an ancient Werewolf that emerges from the shadows after centuries to help the surviving soldiers of a brutal alien attack the only way he can, by turning them! It is a Scifi suspense thriller about a time in the near future when creatures from ancient legends emerge from hiding to help the surviving humans fight sinister alien invaders who have begun a ground invasion of New York City and cut down all in their path with lethal energy weapons. The story centers heavily on Raziel, the last remaining Werewolf as he is forced to begin turning the human soldiers that fall in battle in order to save their lives and rekindles his kind after centuries of near extinction. 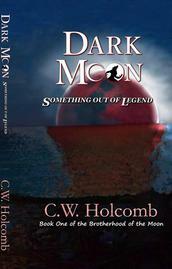 The storyline follows his ancient mind back, to bittersweet memories of his distant youth more than a thousand years before, where he had met his counterpart and soulmate Lupea, a Pure Born Werewolf like himself that he had lost to the savagery of the Wars of the Moon. As he turns an elite squad of soldiers, one by one into newborn Werewolves, his memories of her are rekindled and he is forced to feel the loss of her all over again.